Great image,Connie, and you really did a nice job framing it. Love those gems and also the papers in the background. Wishing you a delightful day. You've been so very busy these days my friend! Love this gorgeous card and how you've coloured and the dp's. That beautiful die was the perfect touch to display your beautifully coloured pumpkins. Stunning creation! Makes me want to get out my stippling brush. Fabulous design, NannaConnie. This image is so pretty!!! Those pumpkins are just prefect in their pre colored beauty! Beautiful card for fall and you picked the perfect sketch for it. Beautiful Autumn card. Gorgeous frame. Anxious to use this set too. Very nice card with the pumpkins. Mmmmm, now I'm hungry for pumpkin pie!!! Fabulous card! Love your mix of papers and wonderful layout. Love this set - I used both uncolored and precolored and love them both. NanaConnie, this card is gorgeous. Love the stippling on a pre-colored image. The layout is perfect and all those papers are gorgeous. Let's also not forget that hilarious sentiment. I wish! NC, this is a beautiful card, so lovely for the holiday, just loved the coloring and designed. Beautiful design, NanaConnie, and gorgeous colouring of the image. Beautiful image and love the sentiment, made me chuckle! Thanks for playing with us at Hobbycutz challenge! Yep, one slice = five servings! I titally agree with that logic! Hahaha! I am super excited about fall cards coming out. I love the earthy tones and great harvest images, and this is wonderful! That is really fabulous!!! And just love the sentiment that you have used used. What a great set!!! Just can't go shopping right now... but oh so very tempted!!! Mmmmmm I love fruit- and pumpkins do have seeds......! 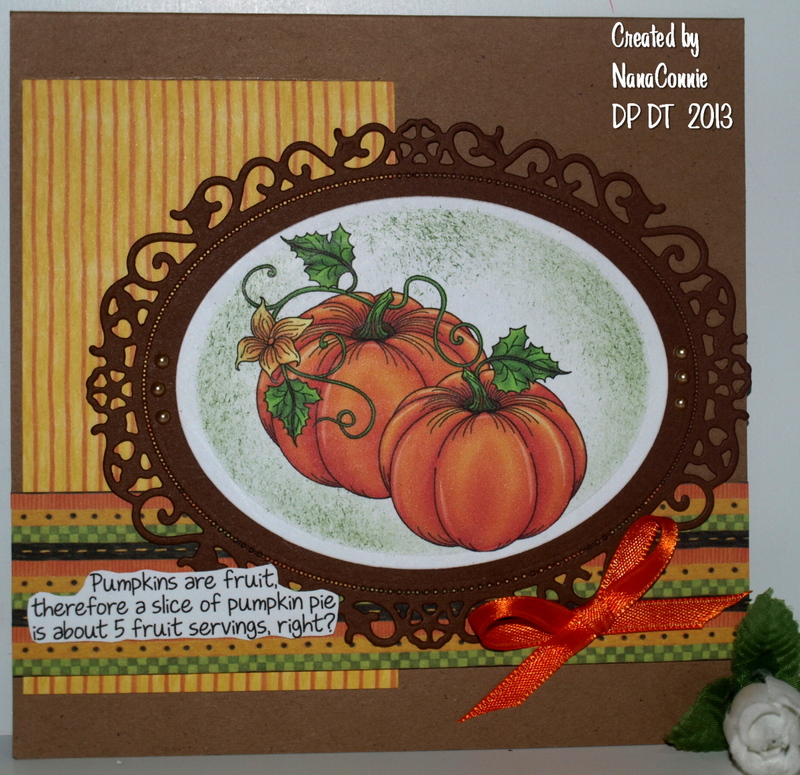 I like Pumpkin (fruit) in a pie as well- love your card- the coloring is fantastic! What a gorgeous fall card - all the wonderful colors. Love the green stippling - very effective around the image. This is really cute NanaConnie... love the sentiment! Great colours too. This is lovely Connie, I love the dark green sponging around the image, nice contrast and such a pretty fall card. Great card! thanks for playing with us at Penny's Paper Crafty this week. Fabulous card Connie,very beautiful and a great take on the sketch. Love the framing of the image and the wonderful fall colour choices. Thank you for joining us at Hobbycutz “Recycling” Challenge and we hope to see you again. Gorgeous fall card and lovely little pearls. Yes pumpkin is a fruit and I LOVE that sentiment because its true, lol! Beautiful framing of the image NanaConnie!